Middle Atlantic Products has expanded its lineup of power solutions with the new Controlled Wall Plate. Designed for simplified and convenient universal control, the Controlled Wall Plate provides extended power and control capabilities to AV, residential, and security devices within a compact, single-gang design. "There are many solutions to control AV components within a rack, but options for extending control are limited and involve manual or expensive motorized breaker panels," said Scott Lowder, CTS, senior product manager of power at Middle Atlantic Products. "This robust wall plate was designed to extend simple dry contact control from the rack to distant powered speakers in the most efficient and reliable way possible." The company states that the model is available with 15A NEMA or 20A Neutrik PowerCON® receptacles. “The Controlled Wall Plate delivers value without the complexity and expense of breaker panels or multiple high-/low-voltage boxes. Its internal power supply completely removes reliance on external input voltage, which is susceptible to voltage drops on the wire, furthering the system's reliability. 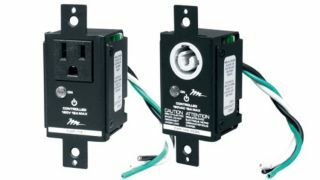 Both models feature LED indicators and low-voltage, integrated contact connections at the rear of the unit, which alleviate the need to run exposed control wires to the front of the wall plate. The PowerCON receptacle option provides the additional security of locking the power cable to the device and wall, mitigating the risk of the powered device becoming unplugged,” according to a recent press statement. Its compact, decorator-style single-gang form factor fits standard wall or floor boxes as well as within a partitioned, multi-use box. Available at an incredibly competitive price point, Middle Atlantic ensures that the Controlled Wall Plate delivers one of the market's simplest and most cost-effective methods for controlling powered loudspeakers, lights, displays, projectors, and any other integrated AV device.